Nipah virus is a new emerging Zoonosis that causes serious disease in both animals and humans. This deadly Nipah virus has killed three people in Kerala and has caused a public health scare. This disease was first reported in the country in 2001 and was first identified in Malaysia. The natural hosts of the virus are fruit bats and Pteropus genus and is associated with fatal encephalitis with fever and headache for around 3-14 days after the incubation period. With the rise of this virus in the Kerala district, the health department is conducting various precautions. Masks and safety kits with full body safety wear have already been distributed to all the doctors, nurses and other staff workers in the hospitals and also at critical care centers that treat viral fever patients. A special task force has been made to diagnose the disease, which is headed by District Collector U.V Jose and DMO Dr. Asha Devi. The diagnosed patients have been shifted to isolated wards and also personnel experts are treating people suspected of being infected with the Nipah Virus. Health minister further said: Directions had already been given to depute more doctors to Kozhikode Medical College from other medical colleges for one week. Those with the viral fever of any kind can seek medical aid from taluk hospitals at Koyilandy, Thama-rassery, Perambra and City Beach Hospital. Only those confirmed with Nipah virus infection will be shifted to the isolation wards of KMCH. “The state government will bear the expenses of treatment of patients at private hospitals”, she added. Nipah virus can cause encephalitis which is brain inflammation. Symptoms of the virus can include fever and headache, followed by drowsiness, disorientation, and confusion. People who are infected with the virus may fall into a coma within 48 hours of showing symptoms. There’s no drug or vaccine to treat the disease. Rajeev Sadanandan, Kerala’s health secretary said: “We are now concentrating on precautions to prevent the spread of the disease since the treatment is limited to supportive care”. 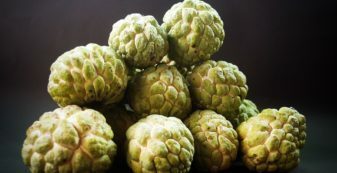 Custard apple, well known as “Sharifa” in Hindi is a light green colored fruit with a bumpy skin.